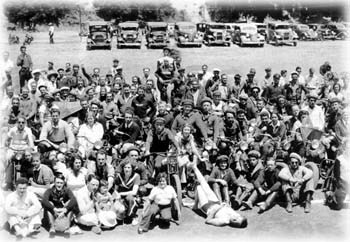 Marlon Brando's trendsetting performance as a renegade biker in The Wild One was based on a fictionalized account of a 1947 rally in Hollister. On the 50th anniversary of history's most notorious biker rally, Hollister is making plans for a peaceful reunion this Independence Day weekend. Heard the one about 'best-laid plans'? AS WITH MOST SEQUELS, it's not likely that the 50th anniversary of the original motorcycle ride through Hollister, set for this Fourth of July weekend, will have the same impact as the first. Not likely, but then again, sometimes things have a way of getting out of hand. Harry Prater was 24 years old in 1947, when he and his bride jumped on his Triumph to join in the road rally that came through town. He couldn't have known he was riding into history. But one thing led to another. The presence of hundreds of leather-clad bikers struck fear into the hearts of local police, who did what police do when they're outnumbered: They called in reinforcements. That led to a near-riot, and eventually to Marlon Brando's characterization of the maligned road rebel in Stanley Kramer's 1952 film The Wild One. Prater, now 74 and retired in Loveland, Colo., blames police for helping make things tense. "I got stopped by this out-of-town cop," Prater remembers. "He wrote me out a $75 ticket for nothing. I didn't do nothing except ride into town with my wife. The cops were all pretty ornery to the bikers." According to Prater, lots of bikers were stopped by overwhelmed and overzealous police. But he blames much of the day's troubles on, of all entities, the local Elks Lodge. "There were a bunch of guys up on the Elks Lodge balcony dropping full highball glasses on the sidewalk below," he says. To hear Prater tell it, the combination of broken glass and the smell of evaporating whiskey got the police charged up, convinced a riot was brewing. Hollister City Councilman Ken Duran was just a wide-eyed kid the day the bikers came to town. "Of course I went to see them," he says. "It was quite a thing. They started racing each other, but it wasn't that bad. There were just too many of them, and it got out of hand. The chief of police ended up jailing some of them." Not that Duran got to see as much as he would have liked. His father found him and chased him on home. Kramer's largely fictionalized movie had a tremendous effect on America in general--and on a 14-year-old boy named Sonny Barger in particular. Barger, who would go on to found the Hell's Angels, was a kid with a tendency toward car sickness and a nascent fascination with motorcycles. In an interview from his motorcycle shop in Oakland, Barger says that day in Hollister--and the Hollywood telling of the story--helped set his life's course. "The original event had a great impact on my life, but I didn't realize it until I saw the movie," he says. "Lee Marvin was my idol--he was definitely the hero of the movie." HOLLISTER IS ABOUT to relive its most famous moment, this time absent the element of surprise that colored the landmark Independence Day rally half a century ago. Keeping surprises to a minimum is what the 50th anniversary event is all about. Planning is the antidote to pandemonium, and lots of people have been making lots of plans. Take, for example, Tom Corbin, vice president of Corbin Pacific Inc. He's in charge of the Corbin Festival--a big part of this weekend's official rally, and one of the best-planned events. Corbin Pacific manufactures top-end motorcycle seats and body parts, and its representatives attend upward of 50 motorcycle rallies a year. "We know everyone in the industry," boasts Corbin, heir to the business his father founded 30 years back. In the spring of '96, Corbin was investigating locations for a new manufacturing plant and was drawn to Hollister. Although it was too late to get involved in the 49th anniversary rally, the timing was perfect for the company to assert its place in the industry--and its adopted community--by sponsoring a major event for The Big Five-Oh. "Some of our members tried to put this rally on," notes Barger, addressing rumors that the Hells Angels had been discouraged from participating on any level. "Then Tom got involved, and he's done a good job so far." Corbin, who has been organizing for more than a year, downplays fears that all kinds of anarchy will break out over the weekend. "I've leased 65 acres of land adjacent to the airport on Flynn Road," Corbin explains. "It looks like we can expect about 100,000 people in the region for the weekend, mostly between 45 and 60. It's not like you have 100,000 20-year-olds riding into town with a chip on their shoulder." So what can this throng of motorcycle enthusiasts expect? At the Corbin Festival, they'll find 150 booths selling food, drink, T-shirts, crafts, jewelry, motorcycle parts and accessories. Test rides will be available, and there will be motorcycles for sale, plus live music. On Friday, July 4, from 5 to 11pm, the bandstand will showcase Cosmos Factory, featuring a couple of Credence Clearwater Revival alumni; the Tommy Castro Band, serving up blues; and Cyclops, with more glory days alumni--this time from the band Journey. Admission to the festival is $5; to the concert, $20; tickets for both are available at the gate or in advance by calling 408/633-2500. According to Mark Maxwell, chair of the Hollister Independence Rally Committee, other officially sanctioned activities include a downtown event, which he describes as "mainly vendors--food and motorcycle industry types--selling jewelry, leather, motorcycle parts, and motorcycles. 'The purpose is to give people something to do when they come downtown, which they will all do." Maxwell notes that the downtown booths will support nonprofit organizations. "Including the money we charge for booth space and official rally merchandise, anything left over after expenses will go to local youth charities," he says. Not to be outdone, San Benito County is sponsoring an event as well, at Bolado Park on the south end of town. Call 1-800-997-2925 for details. For Barger and the Hells Angels, Corbin's is the only game in town. "I just don't care about events put on by non-bikers," Barger says. "Everyone's trying to cash in on motorcycling. The people putting [these events] on are just trying to get a dollar." But while Barger is adamant about maintaining the integrity of motorcycling, he is still excited about the Hollister rally. "I'd like to see this be an annual thing. I want a good West Coast event besides the Redwood Run," he says, denouncing the only other regional biking event as overly commercial. As for the much-touted specter of raucous disorder, Maxwell says local authorities are not looking to repeat the mistake of 50 years ago. "The average rider these days is pushing 40; I mean, they're not looking for trouble," he says. "The biggest concern for law enforcement is the number of people. We're looking at as many as three times the population of the county for one weekend. But law enforcement will be the first to admit they have more trouble with the rodeo than with the rally. The police are going to have a very low profile down here." While Hollister police might lie low, there will be a police presence at the event. Charisse Tyson, owner of Johnny's Bar on San Benito Avenue, says that the California department of Alcoholic Beverage Control (ABC) is breathing down the necks of all local resident licensees. "We're scared to death," she says. "They've made us miserable." Tyson reports that ABC agents have called bar and liquor store owners and threatened dire consequences if any unauthorized consumption takes place in or near their establishments. "They way they're handling this," Tyson contends, "they're going to start a riot." With an eye toward controlling both traffic and tempers, San Benito Avenue--Hollister's main drag--will be closed to all four-wheeled vehicles. Other roads will be designated as one-ways for the long weekend. Yes, plenty of planning has gone into the 50th anniversary of that first mad two-wheeled rush into Hollister. But that's no reason not to expect the unexpected. From the July 3-9, 1997 issue of Metro.